This is one of those things that has become a popular social phenomenon. People can read (books, articles), see (YouTube) and share (videos, articles, apps) about how they get into their personalized productive routines every morning. I started dissecting my own mornings when I finished school, as I actually had most mornings free from external obligations. I realized that, the more I tried to establish a ‘morning routine’, the more I realized what kind of tendencies and habits I had. Every night, I would jot down a schedule for the following day on my phone, and only follow through some of them. I then started writing down long-term goals on my laptop, and getting the overall picture of what I wanted to accomplish monthly, and started adjusting my schedule to that. Now, I have gotten myself a bullet journal where I strictly (and religiously) write down my tasks and goals monthly, weekly and daily. Writing by hand does take more investment, but skimming through the goals that I have written at the start of one month prevents me from falling off the grid. In summary, I basically went through a series of trial-and-error, and realized that the most effective way for me to keep a morning routine (and any other day routines, to be honest) was to remind myself of my long-term goals – which I did by 1) writing monthly goals in places where I could always see them (on this blog, on my journal) and 2) weekly goals, to narrow down my focus to a few things and avoid overwhelming myself. Even without the burden of school, I find it incredibly hard to follow through an established morning routine, especially considering that I love sleeping and if I have one bad night, it would completely trickle down to the next morning. I try to maximize my morning productivity by inspiring myself. One of the things I do, as cheesy as it may sound, is read this blog: My Morning Routine. It has a Q&A with adults of varying jobs describing their very specific morning routines, and reading it enables me to get creative with my own routines. The quickest and most adaptable form of tool that you can use is your phone. There are numerous tools and apps that you can download and play around with; I tried that myself, trying out apps like Habitica, Todoist, Beeminder, etc. But I removed them from my laptop/phone almost as soon as I got them. I have nothing against them, but they were just not for me. I felt like they just added something extra and unnecessary to the apps that I already had, without actually enabling me to become more efficient. So I made use with the three most simple apps on my iPhone: ‘Calendar’, ‘Notes’ and ‘Reminders’. Calendar: its primary use is as a future log. note down future tasks and events that are unlikely to change, such as classes, appointments, events, etc. Notes: I have several: 1) Schedule: I have the color-coding key to my calendar, e.g. blue is for Events, and purple is for Music. I also have written down a personal ‘Education’ schedule where I plan which days of the week I plan to study what courses. 2) Blog: Here I write down my 5 weekly posts (that I plan on weekends) and any other blog-related ideas that I may get at any time in the day. 3) My other notes are not as important. Currently I have a Notebook journal guide, an organization guide for my bullet journal. Morning routine (from the moment I wake up until before lunch): I have worked out a morning routine that I may or may not follow everyday, like I talked about before. things I want/have to do during the day. Night routine (until bedtime): The purpose of this is to enable me to wind down and ‘ease’ into my bedtime, so I write things like ‘read a physical book’ and ‘recap and plan for the following day’ to help my mind settle down. Tasks: I have this as an ’emergency’ list for anything that I urgently need to do, or for things that I plan to do but haven’t necessarily jotted them down on my schedule. Weekends: This is my weekend to-do list. I usually have more events/outings planned for the weekends, so I don’t adhere to the usual ‘business day’ schedule. I particularly have this list to ensure that I prepare well for the following week (e.g. ‘Plan blog posts’), remind me of simple tasks (e.g. backup my laptop), and invest in more creative tasks that I normally wouldn’t give myself time to do. 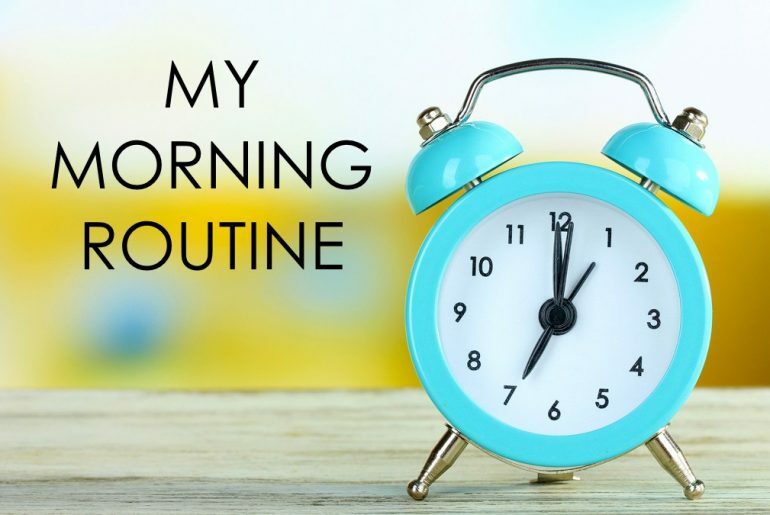 The title of this post is about establishing a morning routine, but you may have realized that I have also talked about my afternoon and night routines – basically my day routines. This is because the act of consciously trying to organize my mornings has forced me to look at how I organize the rest of my day, because my mornings depend greatly on how I end my nights (hence my night ‘winding down’ routines). So establishing my morning routine isn’t so much as a morning process, but a whole organizational day routine. Personally doing these things enables me to become more organized because it forces me to look at and understand myself… but, I may also be disillusioning myself on how productive I am being. Do you have a morning routine? If so, how and why?